To increase speed and maintain quickness, you must train that way. Water provides an environment that allows speed training through a full range of motion without the impact and pounding associated with most sprint drills. When performed correctly, cycling speed in the water can be even faster than on land. Since there is no impact with the ground to slow down the cycle, sprinters often reach higher cycle per minute rates in the water than during land based sessions. You can overtrain in the water just like you can on land. The primary pressure in the aquatic environment is on the cardio-pulmonary system, so be especially watchful for signs of breakdown in this system. Give yourself a chance to recover between training sessions. The hard – easy system of training works best with an extra easy session thrown in whenever you are in doubt about your recovery from the previous session. If you are using the water for an easy day recovery from your land training, keep it easy and don’t go much beyond level 2. If you’re transitioning from a deep-water program to land during rehabilitation, or if your pool is too shallow, shallow water running is a good alternative or supplement to deep water running. You are only carrying about 10% (loading) of your body’s weight when standing in water up to your shoulder joint line. This is a good place to start when you are transitioning from deep to shallow water and gradually loading the body. After a week or two at the shoulder level, move to chest level, which is about 30% loading. As your program moves along (two to three weeks), progress to water that is hip level where the loading is about 50%. This procedure allows your body to slowly adapt to the impact of land-based running. To begin, leave the flotation belt on. This will reduce the percent of loading. 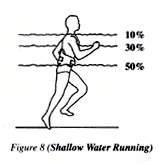 As you progress, take the belt off to increase the loading and prepare Figure 8 (Shallow Water Running) for the impact of land running.